As the delegates to the CBF Plenary Assembly are about to leave their respective countries to fly to Dar Es Salaam, here is an update from Archbishop Charles Bo. In whatever situation we are, we can always find a reason to thank the Lord. And let’s intensify our prayers for the Plenary Assembly from June 24-July 3, that it may yield abundant fruit for the Kingdom. After 45 days of hectic work, the church and its group of committed volunteers, take a pause from the long journey of re-building our people’s lives, to express our deep gratitude to all of you who stood by us and the people of Myanmar in their hour of darkness. Thousands are returning home, or where their home used to be. Children return to school, knowing some of their friends will not be here. Farmers are returning to a slowly healing land, wounded by the marauding sea on that fateful day. The Ayeyawady River is subdued into serenity after straddling killer waves and exhibiting dead bodies for a month. It has been a heavy month for the church. In Dedeya, Fr. Benedict and his group valiantly buried dead bodies, exposed to sun and rain for a month. It is a challenging work, for days together, many villages were a valley of bones, and now they are rested with dignity in a place. Elsewhere the caregivers, our volunteers, faced threats to their own physical and psychological health, living amidst contaminated water and rotting bodies. Some have to be carried back to Yangon for medical attention. All the parishes have been turned into disaster response teams. Food and Non Food Items are distributed through them. Many times the Buddhist monks are fellow sojourners in this act of mercy. Just a month ago, no family had wish or wherewith all to send their children. This month, with our support for uniforms, books and fee, hundreds of children are returning to the school. This return is healing and is the first signs of life to the battered communities. Hundreds of Temporary shelters are coming up. Seeds are distributed. The Church is designing a healing process through Psycho-Spiritual training and trauma healing services. The nightmare is slowly replaced with hope. Catholic Bishops Conference of Myanmar (CBCM), all the religious and faithful, Karuna (national Caritas) and the Caritas international is reiterate their commitment. We thank all of you at this juncture. Our work has been very challenging, done under great restrictions on access. But you all made our work rewarding by standing by us with your great fellowship. Holy Father Pope Benedict XVI evinced fatherly concern from the day one. He mourned with the Myanmar Bishops when they met him for their ‘ad limina’ visit. His Delegate Archbishop Salvatore Pennachio rushed in by the first plane available and personally interacted with the survivors and the caregivers all through these days. The churches from various nations contributed their mite and prayers to our work. It is still a long journey. The full recovery will take at least two years. 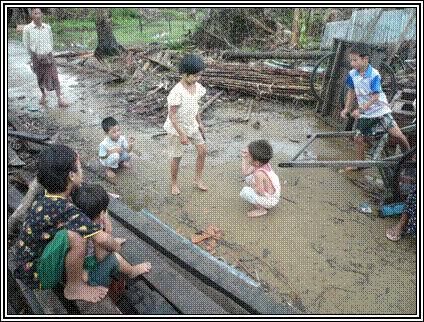 Cyclone Nargis was nature’s nuclear attack on our people. There are villages destroyed without any trace. The farm lands are polluted with the sea water. The human asset is diluted, social assets destroyed, natural assets mutilated with wanton destruction. 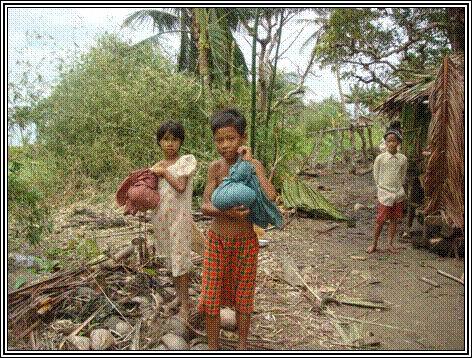 The poor of Myanmar , already handicapped by some of the worst permanent disasters, are crawling back to normalcy. As the waters raged in the pre-dominantly Christian village, the monks from the nearby monastery were on the noble mission of saving people. A monk swam across the currents to pull out a woman who was about to be dragged by the marauding river. In the far off Phyapon, where the Christian group Karuna was distributing aid to the survivors they choose Buddhist monks as their partners in distributing aid to non Christian villages. 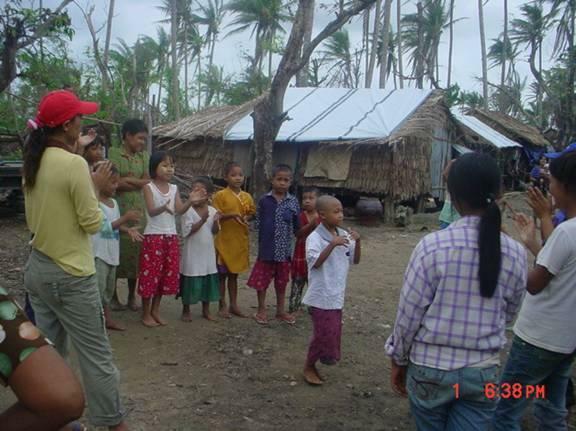 All religious groups were made victims by the cyclone. All places of worship-monasteries, clergy houses and convents bore the brunt of the deadly cyclone. Nargis, in its monstrous ferocity tore through many of the famous places of worship of all religions. In Aima, in the Pathein Diocese, Fr Andrew Soe win, offered his life as a supreme sacrifice in trying to reach his marooned people. His body was found after 18 days. But nothing deterred them from the sacred duty of saving lives. In the predominately Buddhist Country, where Metta and Karuna (mercy and compassion) are the major tenets of a great religion, compassion broke forth like a healing stream after the demonic deluge. Churches and Monasteries became the refugee camps. With death and mayhem threatening them in their villages, thousands took refugee in sacred spaces, seeking coping and mutual consolation. Even before the government could move in, or the do-gooders and NGOs could move in, spontaneous charity sprang forth with Buddhists feeding Christians and Christians feeding the Buddhists etc. Nargis broke many things in an evil way. Goodness broke all parochial borders that fateful night when death danced arrogantly across wounding a nation. In Bogalay the Hindu temple opened its portals to feed the multitude. In the ravished streets of Yangon, Muslim merchants were distributing food to the starving masses. More poignant was the response of many poor and lower middle class people. They collected whatever they had and every weekend they treaded across in aid convoy to far off Labutta. Nargis stripped naked a nation with violence but people of all faiths are clothing it now with compassion. With other Christian Communities, Catholics threw in everything into rescue – money, material and man power. Many young men and women volunteered to go to the risky villages, strewn with dead bodies of people and animals. The first psycho social assistance came from nuns who risked their lives, by undertaking dangerous boat travels, without life jacket etc. They were the first ones to hold mothers who lost their children, carried orphans and consoled a grieving community with prayer and simple presence. Hundreds of seminarians were the first rescuers, clearing the villages of debris. All these are done under extreme restrictions. Through the national Caritas, assistance continues. Compassion is the common religion in the post disaster phase. In Myanmar people lived with various tags – religion, colour and tribe. But now Nargis taught us all, that human tears have no colour, no religion, and no tribe. Please inform Fr. Emile Louis Tisserand by email that it is for “Yangon – Archdiocese”. Thanks so much for your compassion for our people of Myanmar. Let us assure the Archbishop that Myanmar will not be forgotten once again! After a month, the people of Myanmar , limp back to semblance of normal life. But even by World Food Programme data, only 60% of the people in- need, are being fed. Villages are yet to be reached. Dead bodies are becoming a great concern. Drinking water is till a luxury for these homeless people. Heavy monsoon is lashing areas already wounded cyclone Survivors. The number of people who were without homes is around a million and a half. The delta houses were already fragile, with thatch roofs. With 90% of the thatch trees destroyed by the cyclone, shelter is becoming an urgent need. Also destroyed are the community assets of the people. 90% of the schools in the Delta region and the Laputta – area are destroyed. Children are trying to study in roofless schools. 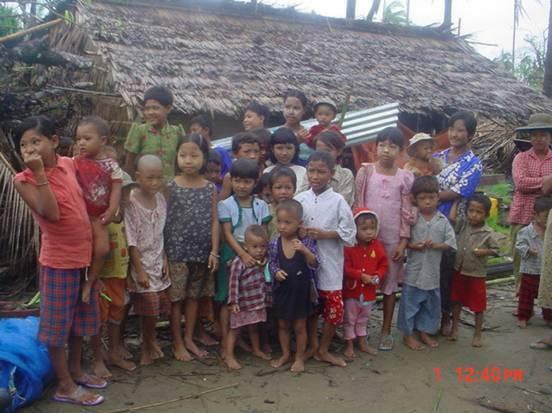 Without proper uniforms and books going to school is a challenge to cyclone- affected children. Protection of children is becoming a serious concern. We have started helping children to be back in school, with support in uniforms and other educational needs. Churches, pagodas and monasteries are in ruins. Thousands need trauma healing. In a country known for deep spiritual practices, praying could be one way of healing of painful memories. Even the consolation of praying is denied. The emerging need is for shelters – tarpaulins, thatches and zinc- sheets. The Church has started supporting shelter needs. 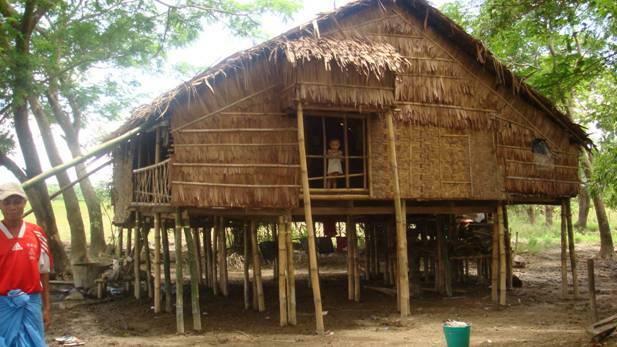 At least 700,000 huts need either repair or rebuilding. Soaring zinc prices and logistics constraints delay giving shelter to thousands. To all of you, who supported us during the emergency phase, we owe a deep debt of gratitude. We appeal to the world to continue its concern for the people of Myanmar. Our people need to return to a ‘home’ where they can start their lives once again. Once that happens, Church can concentrate on reviving livelihood, especially agriculture and fishing. “Would you like to go to school if I help you?” Ni Tut smiled. He is now in one of our boarding houses among hundreds of other children. Myanmar will not be forgotten once again! Here are two concrete ways we can help our brothers and sisters in Myanmar. Thanks for your concern and care for our people I deeply appreciate your love for our people here. I shall continue sending the situations here. There is a specific need presented to us by Sr. Sylvia, SFX – TABLETS – to purify water for drinking. Seemingly, tablets of this kind were sold in the pharmacy but cannot be purchased now. It is not known if this is out of stock or that being held for what purpose. Wells cannot be constructed this time. The affected areas are not yet safe to dig wells. Immediate need is tablet purifier. 1. Discuss this matter with Drug manufacturers. Produce this kind of tablets good for 25 litters at the most of water since they don’t have big water tanks. Perhaps just use big plastic containers. Am not sure what is the biggest plastic containers are available here. 3. Upon arrival, send them to my office at CBCM. 292 (A) Pyay Road Sachaung, Yangon, Township, Myanmar. I will instruct Sr. Patricia, my staff to inform Archishop Charles and Bishop John of Pathein to collect them from my office. This is to avoid complications if the tablets landed at CBCM and nobody takes responsibility. 4. For other Medical aids, I would like to suggest that the procedure is the same so that they will not go to wrong destinations. I hope in this way, we can be sure that they reached the beneficiaries. Thank you so much for all your prayers and love for our brothers and sisters in need. yours Sr. Emma Gunanto, osu. It is a month since the face of Myanmar has changed. Nearly 150,000 of our country men and women are no more with us. On that fateful night, the deadly cyclone Nargis changed the map of Myanmar in Yangon and Ayeyawaddy Delta. Satellite images graphically registered the ‘before and after pictures’, portraying a destruction of large tracts of land. What any satellite could not register was the mutilation of soul of our graceful and long suffering people. We are a nation in mourning. 2.3 million of our people have a new name: refugees and homeless. At this very moment, when you are reading this report, thousands who survived nature’s gory violence, will be lining up in some remote villages, waiting for food and aid. The dead are also waiting for a decent burial – Yes! On the top of the trees, floating in waters and in the bushes and roadside, the spirit of our people is waiting for eternal rest. With grateful heart, I thank you all, the world, the leaders and ordinary people who rushed with great compassion. The Church as a compassionate mother reaches out to every human tragedy. You have known our pain for too long, but when nature colluded in increasing the pain, you rose as a one family. A big THANKS to you all. Doing good is a Herculean challenge in our nation. We are a church challenged from all directions. In those affected areas, all our churches, convents, clergy houses, orphanages lie in ruins. Yet from the day one, we have been going in search of survivors, many times being the first outsiders to reach them. A dedicated team of Karuna (Caritas) staff, church personnel and volunteers have been working day and night in the most affected areas. We are saving lives, we are bringing hope. With the arrival of the Emergency Response Support Team, we feel encouraged, guided and accompanied in our endeavor to reach out. Thousands receive life-saving assistance, shelter and other basic needs. Nature, in anguish and fury, uncovered the permanent disasters of a long suffering people. China’s earthquake response exposed painful contrasts. The world needs to journey with the people of Myanmar for long time. Media’s attention to human tragedy is swift – but also passing. Humanitarian response cannot follow the media. Myanmar needs longer accompaniment, a sustained attention of the world community. This report, I hope, will facilitate that long march with our people. Dear Friends, how can we read this and not cry and rush for help? May the Holy Spirit empower us to reach out to our most needy brothers and sisters. Our friend wrote that yesterday the actor – photographer who sent photos to BBC (not BBS!) and was not afraid to tell the truth, has been arrested. In this seemingly hopeless world, let us be signs of hope, firmly rooted in the living Word. June 4, CC-Camp – over a thousand people rescued. One day, authorities came to call people to go to their camp. Nobody wanted to go. After some threats…70 elderly offered to go and after that nobody knows where they are. From other CC-camps, people were forced to go back to their villages. They were put on two boats – overloaded and capsized, most if not all were drowned to death. Some trucks delivering aids … were stopped, drivers’ license confiscated, drivers were kept for hours and released later with the goods. 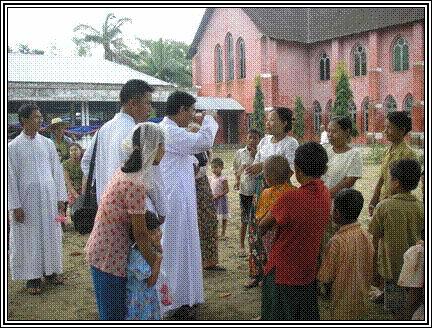 Priests in Pathein diocese planned to keep the people in their camps and men could go back to their villages to prepare the field for planting and gradually, they could go back to their villages when housing and water system will be installed. However, this plan have been aborted, people were asked to return to their villages. 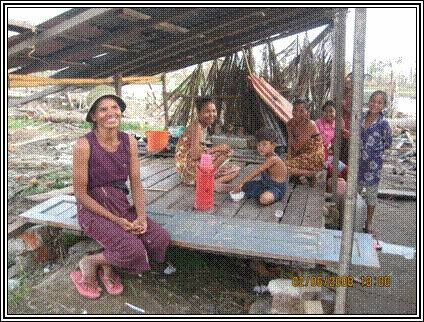 Priests have to have plan “B” by building temporary housing for the people, hopefully some NGO’s can organize centers to support the basic needs of the people like the other villages with Centers where people can get their food supply. A famous outspoken local actor who had been in prison several times for speaking the truth could be arrested soon for releasing photos to BBC from here. We accompany our brothers and sisters on the Way of the Cross… May we and our children see better times. Lord, have mercy. Just now I got another poignant word from Archbishop Charles: his concern for children is touching and to the point. Monday 2nd of June marks the start of the school year in Myanmar and also one month after Cyclone Nargis. However, for so many children there will be no school to go to. For the children in the delta region their lives have been turned upside down. Many of them lost their parents and their homes. Last week I visited a village called Aima and some surrounding island villages called Pha-ya-lay-gone, Pein-ne-gone, Ta- yoke-gone, and Lein-maw-gone. Aima village is in Labutta township in the southern delta region and is very difficult to reach. It took almost ten hours to get there by boat. There, I met families who are still struggling to survive and feed their children. In this area all the schools have been destroyed. For the children of Aima, the horror of the cyclone still haunts them. Many children cry at night and when it rains. The children fear the worst and re-live the trauma of the night of the 2nd of May. In this village there are so many inner wounds that must be healed over time. To date very little aid has been able to get to these communities. For the first two weeks the only aid received by these people was from the Catholic Church. They told me that without this, they would not have survived. The government now only supplies two cans of rice per person per day, which is not enough for people to live on. In some cases people have been asked by the government to leave temporary camps and return to their villages. In many of the villages there was still no shelter, food or clean water and the government only supplied them with a few kitchen utensils. My trip to Aima also demonstrated how important it is for the Catholic Church to continue our work and ensure that we support communities as best we can. To date we have been able to supply food, clean water, tarpaulins for shelter, cooking utensils and medical supplies to approximately 20,000 people in Labutta township. We now must continue to support them, firstly to survive but also in rebuilding their lives. The people I met remain modest in their requests, and ask only for food and shelter. The start of the school year is also an important reminder that we must prioritise the needs of children who have been affected by Cyclone Nargis. The Church will play a role in ensuring that children are reunited with family members and are given toys and space to play in. We must ensure that children can also return to school as soon as possible. Without routine such as school and normal daily activities, children will find it much harder to heal and miss out of vital education. On my recent trip, amidst so much death and destruction, the resilience of children was brought home to me by many stories that I heard. In one case a lady called Veronica told me of how she and her three month old child were stuck in their house when a tree fell over and blocked the door way. The floodwater rose inside the house so she pilled furniture up and climbed above the water. As the water level rose she had just her head and her baby above water and one ft left until the roof of the house. She remained like that until the following morning and the water gradually subsided. Veronica told me this story and then added that during this time her baby had not cried once. I also heard the story of a five-year-old boy in the village of Lein-maw-gone. He had been separated from his family and when the floodwater rose he could no longer stand on the ground so he grabbed onto his dog. He held onto his dog as it began to swim. The dog kept swimming for hours until he could eventually bring the boy to the safety of dry land. Sadly, following this amazing feat, the dog died of exhaustion. Having met the people affected by Cyclone Nargis and seen the conditions they are now living in one month later, my recent trip left me with both hope and anguish. There is still a great deal of suffering and people need considerably more aid and help to survive and rebuild their lives. However, I am also optimistic that the Church can play an important role in meeting these needs. It is with this in mind that we must go forward, work together and serve those in need more effectively and to the best of our ability. Today I read in the news that 30 medical doctors from Indonesia have gone to help the victims in Myanmar. I am sure that more people from other countries have come to ease their suffering. Dear Friends, what can we do for them?